I feel like I’m playing matchmaker and I’m just giddy with excitement waiting to introduce two folks that I just know are going to be perfect for one another. Except this isn’t about dating and one of these people isn’t a person at all. So what am I rambling on about? 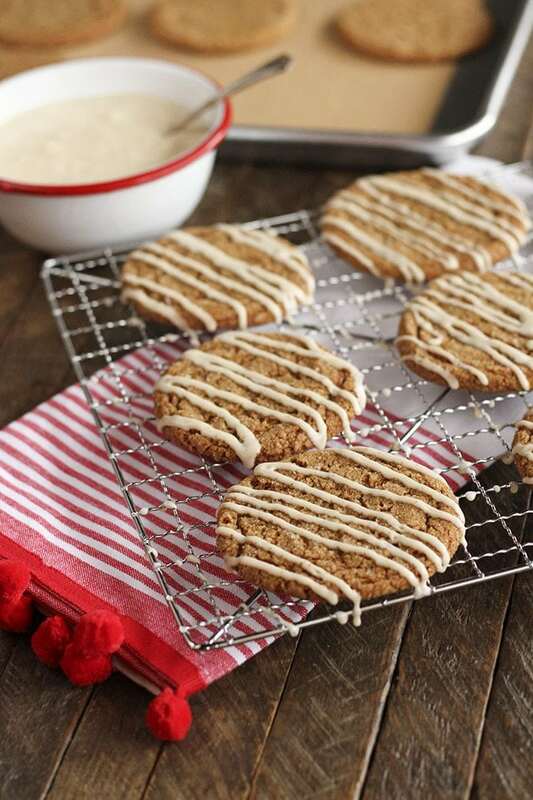 These absolutely delicious Gingerbread Cookies with Eggnog Drizzle. Y’all are a perfect match. I just know it. Seriously, though… these are my new favorite cookies. 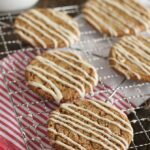 I just love the flavors of spice that the holidays bring and am a huge fan of ginger anyway, so I figured I’d be on to something with these, but boy did they turn out amazingly. Like I can’t stop eating them – amazingly. And y’all, they’re pretty dang easy, too. I love gingerbread, but I’m not always in the mood to have to roll dough out and deal with all that fussiness. With these, you get all the flavor (plus more) with a whole lot less work. This recipe doesn’t even require you to refrigerate the dough, like many do these days. When you want some cookies, you’ll have them in a short time. No more waiting! Now, the Eggnog Drizzle isn’t 100% necessary. 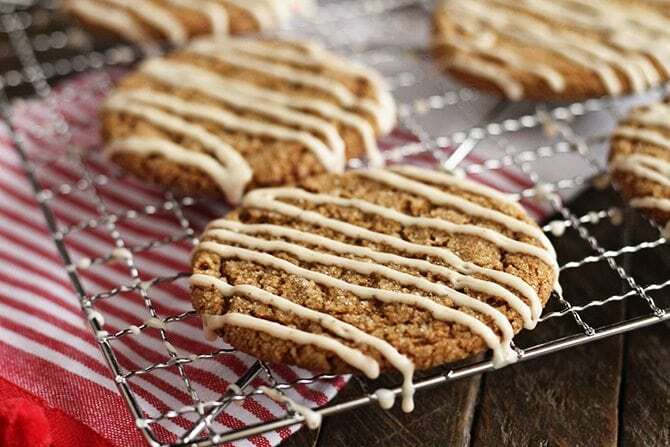 The cookies are amazing right by themselves – chewy gingerbread deliciousness – but that drizzle just adds something special. Everyone who tasted them with and without the drizzle preferred them with it. But it’s totally up to you. Except that I said to make the drizzle. But you don’t have to. But you should. 🙂 Y’all enjoy! Preheat the oven to 350°F and line a cookie sheet with parchment or a silicone baking mat. Beat the butter with a mixer until smooth. Add 1 cup of sugar and cream together. Add the egg and mix well. Add the molasses and mix well. In a large bowl, whisk together the flour, baking soda, cinnamon, ginger, and cloves. Gradually mix the dry ingredients into the wet. Mix well. Pour the remaining 1/2 cup of sugar in a small bowl. Drop the dough, using a cookie scoop, by 1 1/2 tablespoon dollops into the bowl of sugar and roll around to coat. Place the dough on the cookie sheet about 3 inches apart. Bake for 12 to 14 minutes. Allow to cool on the pan for 5 to 10 minutes before transferring to a cooling rack. 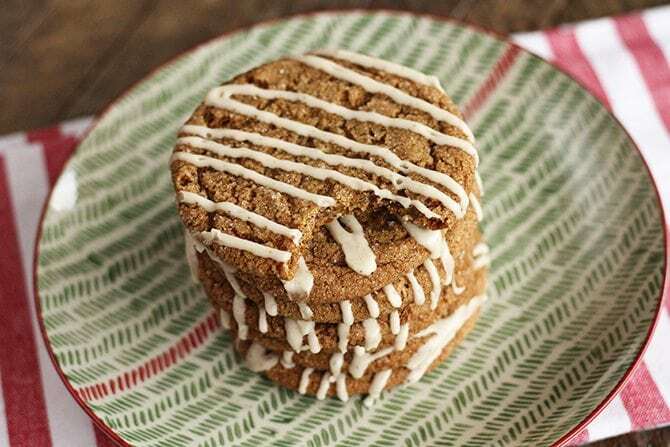 Once the cookies are cool, make the drizzle by mixing the powdered sugar, eggnog, and nutmeg together in a medium bowl. 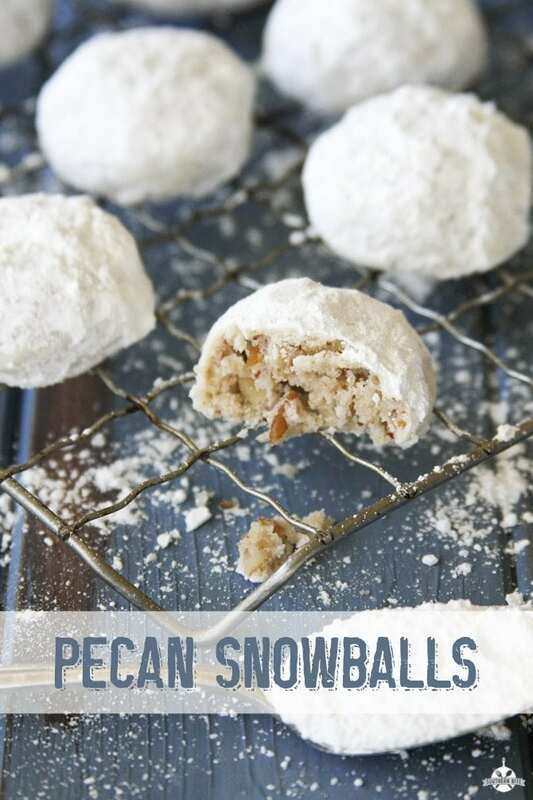 Add extra powdered sugar or eggnog to get it to a thick drizzling consistency. Pour the drizzle into a zip-top bag and seal. Cut a small opening in one corner of the bag and drizzle the glaze over the cookies. Allow to harden. Store in an airtight container. 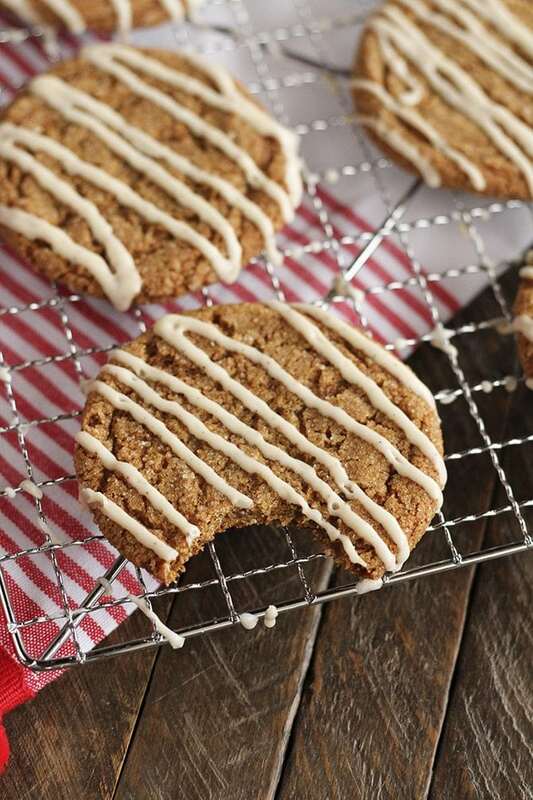 I love eggnog and I love ginger cookies so together they’ll be great. Getting the ingredients today. 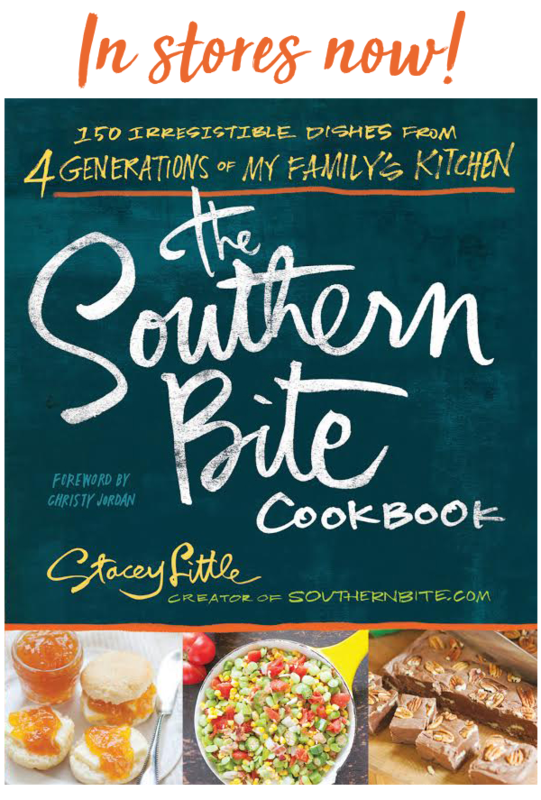 Thanks for the recipe …. Merry Christmas!!! I sure hope you’ll enjoy these! I’ve eaten 4 just this morning! Merry Christmas, friend! 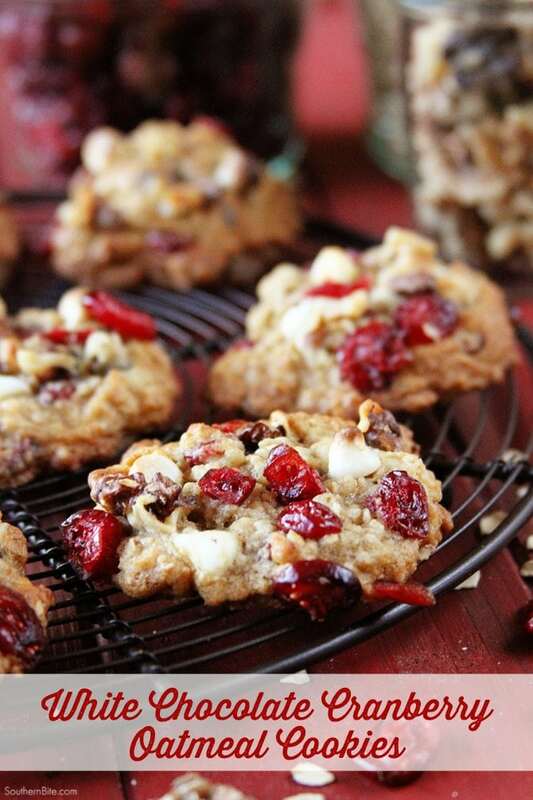 I doubled this recipe for a cookie exchange, but they did not go flat in the cooking process. They stayed in the ball shape and had to be flattened with a fork when they came out of the oven. I went back over this recipe with a fine tooth comb to see if I had made any mistakes but couldn’t find any. The dough did seem a bit dry…any suggestions? Thanks in advance! Hi Cindy! I hate to hear you had trouble. I’ve actually never had trouble with this dough being dry. If anything, it’s been little soft to roll in the sugar. There could be two things going on here. 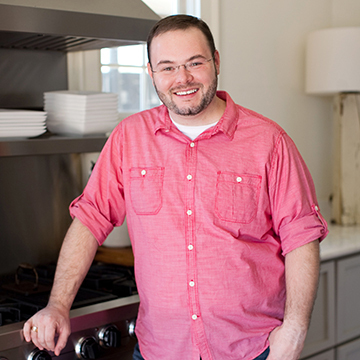 First… How do you measure your flour? Are you scooping into a canister or bag with your measuring cup or are you spoon it into the cup and leveling it off? The only other thing it could be is that your butter wasn’t soft enough, but that shouldn’t have kept them from spreading in the oven. Thank you for your reply! I used a 32oz bag of flour since I needed the 4 cups and then added the extra 1/2 cup. I bet that is where I made the mistake. I didn’t measure out the 4 cups and there must have been extra in the bag. 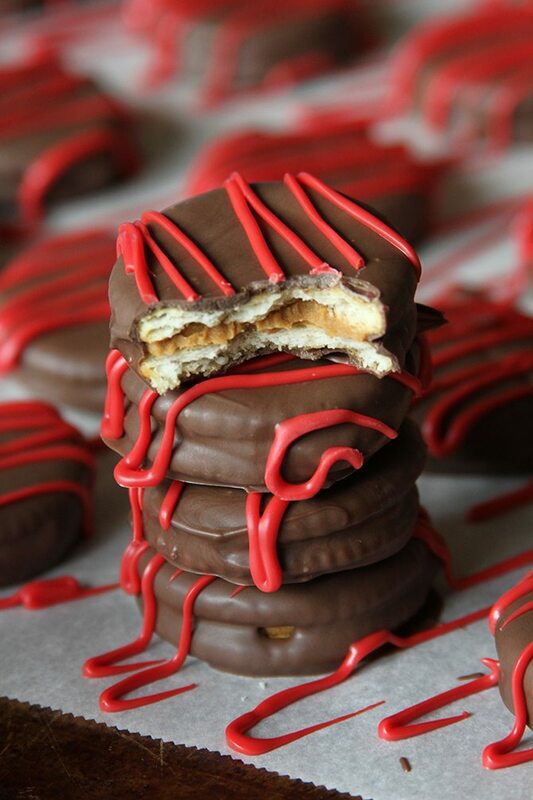 I will be making these again since they tasted great! Merry Christmas! Merry Christmas!! I hope the next batch turns out better for you! I cannot resist Gingerbread cookies!! Stacey, using my tablespoon-sized dough scoop, how many cookies will this make (approximately)? P.S. Would be mounded tablespoon, not level. I usually get about 26 cookies with a 1.5 tablespoon scoop. No worries! Hope you enjoyed them! I made ginger cookies that didn’t come out as chewy as I’d hoped. 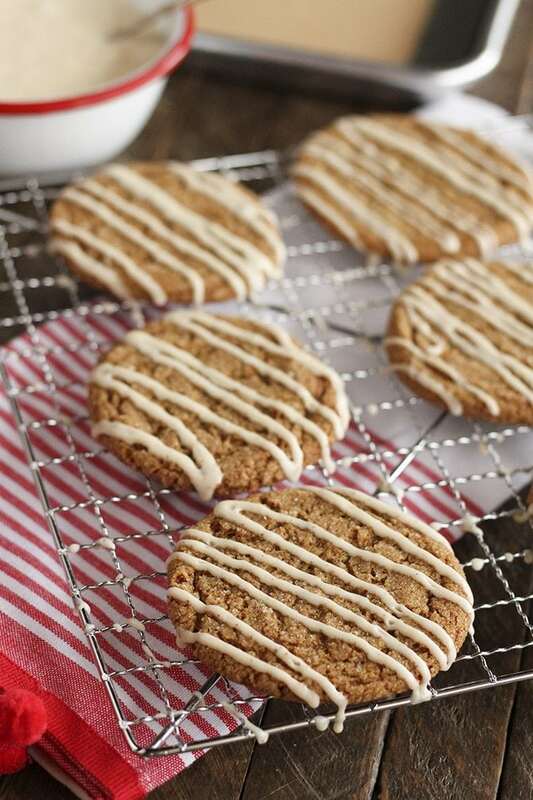 These look really good with the eggnog drizzle. Yum. Thanks, Joanne! These are definitely a new fav!